Is Michael Crawford the Quantum Code a Scam? Yes, It Is. Here's Why. Is Michael Crawford the Quantum Code a Scam? YES, It Is. Here’s Why. 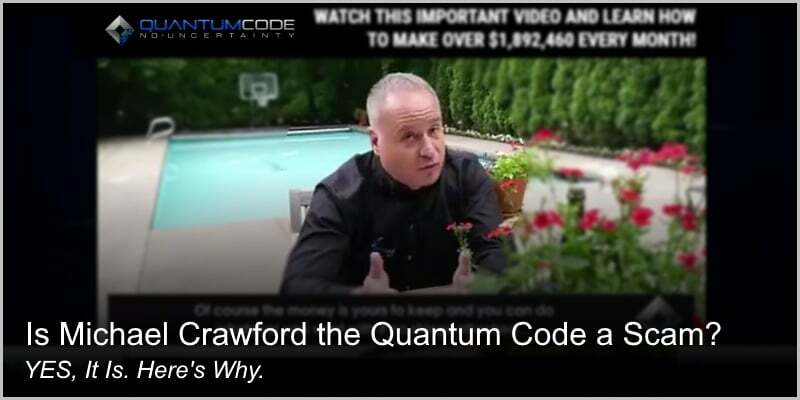 “The Quantum Code is 100% guaranteed way to make profits every day, forever…” – Michael Crawford, the founder of Quantum Code trading software. …Is Michael Crawford the Quantum Code a scam or legit? As I will prove you in the Quantum Code review below, it’s nothing but a vile rip-off scheme, designed to milk you dry. Therefore, don’t get blinded by their happy talk and promises of fast cash on auto-pilot… Or you end up losing every single penny in your pocket (and your credit card). But let’s dig right into the details now and you will see yourself. My Verdict: Michael Crawford the Quantum Code is a scam and a bald-faced lie. There’s nothing but hot air and smoke coming from these heartless con-men. Stay clear! Better ALTERNATIVE to the Quantum Code Scam That’s Uniquely Yours. And These Testimonials Are Proof. Full Review – Is Michael Crawford the Quantum Code a Scam? 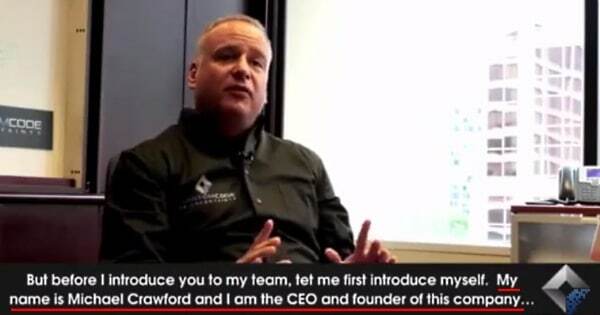 According to his own words, Michael Crawford is a multi-millionaire and a creator of the Quantum Code software. Before that, though, he worked in New York for years, doing some high frequency trading for lots of wealthy people. Because he is so remarkably generous man. Plain and simple, he wants to help ordinary people get millionaires. And that’s why he created the Quantum Code system. 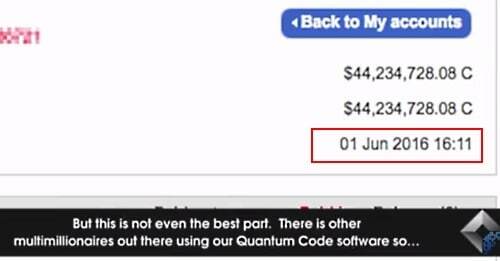 In short, the Quantum Code is a software which allows you to trade Binary Options (click here to learn what Binary Options are and how to trade them). In order to trade Binary Options, though, you first need to open a new trading account with the Binary Options broker of their choice (more about that below). Once you have your trading account, you need to fund it with minimum $250. Be warned: This is REAL money, it’s YOURS, and it is used for trading. The Quantum Code is a piece of trading software which connects you to your trading account and allows you to trade. It has manual and full autopilot modes. In manual mode you do the trading. If you choose full autopilot, the Quantum Code software will do all the trading for you. If you win, you make profits. If you lose, well… you lose your investments. As you can see, trading involves risk. Hold on though, as it’s not the whole story and there’s more to come. Please keep reading. …How Much Money Can You Make With the Quantum Code? What Does Michael Crawford Promise You? Wow! If it were not a fraud, it would be an absolutely awe-inspiring business opportunity, do you agree? Below I am going to rip the whole Quantum Code thing apart and prove you that Michael Crawford lies every single time he moves his lips. Therefore, there’s no need to waste time looking for non-existent Michael Crawford biography or Michael Crawford Forbes articles. Because there are none. 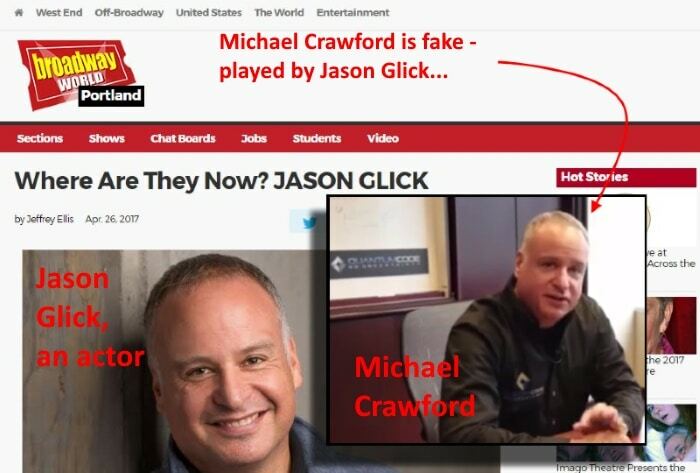 On the other hand, there is a huge problem connected to the bogus Michael Crawford. It means that there is NO 100% winning software powering the Quantum Code. In other words, not only Michael Crawford is fake. The WHOLE narrative is fake. And it’s easy to prove. If the Quantum Code is fake, its testimonials must be fake too, right? See! Are they on drugs or something? 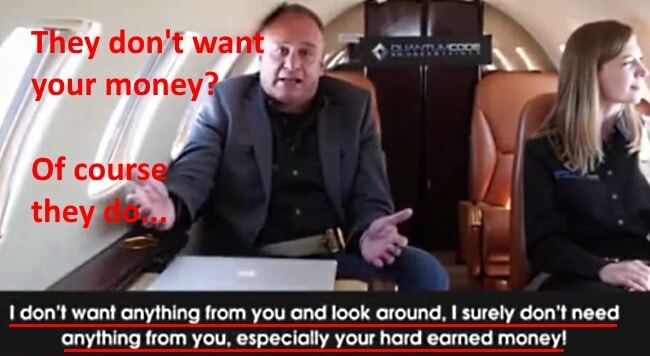 Clearly, the stupidity level and baffling arrogance of these con artists behind Quantum Code are astounding! This fake Christy shows up in many different scam sites (for example, the Brooks Blueprint). Check it out! The trick is that all these face images used by the Quantum Code, Brooks Blueprint, WPZoom etc., are taken from the Russian website http://randomuser.ru. which generates random fake users (for demos like shown above, etc.). All these fake security trustmarks found in the Quantum Code website are just plain image files with ZERO protection. These Quantum charlatans are just trying to convince you that their website is safe and secure. While it’s not! Be warned: It’s very risky to use credit card in a website that is not sealed by security firms. If security badges are not real (not installed by special plugins and are not clickable) better don’t use your credit card at all. Red Alert #4: Quantum Code – the only 100% guaranteed way? First, Is the Quantum Code really the 100% guaranteed way to make profits every day forever? Second, they claim that their software is the only such one. 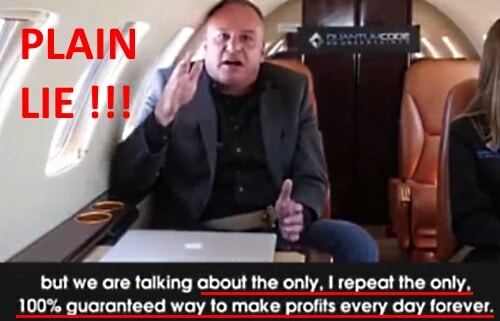 … Brooks Blueprint scam, Rio Profits scam, Safeguard Trader scam, Profits Infinity scam, etc. They all claim to have 100% strike rate. So nothing new under the Sun. Red Alert #4: They don’t want your money? This is nothing but a bald-faced lie. Remember, the whole scheme is built up to squeeze every last resource from you. Seriously! Apparently, the victim is not a native English speaker but he still lost a lot of money to these cyber pirates. So how come a year later these 20 free spots are still vacant? The con artists have faked the urgency factor. It’s just to make you feel as you if you could easily miss that once-in-a-lifetime opportunity… And thus you hurry to sign up at once. In reality, though, you can always sign up with them if you want. They are plain lying to you. There are many more red alerts (like fake ‘Featured on’ badges, contradicting math, etc.) However, I think even these 5 Red Alerts described above make it plain clear – The Brooks Blueprint is a scam. My Verdict: Michael Crawford the Quantum Code is a scam. I urge you not to believe one single word that they say. Stay Clear! Now that you have reached the end, Is Michael Crawford the Quantum Code a scam or legit? Please let me know by dropping a comment below. Hey, Abel, and thank you for contacting. Sad to hear you have fallen their victim. And, truth be told, you can be sure it is extremely difficult to get your money back. First, they are professional con artists. They know how to hide/eliminate all their digital footprints. I mean, who are the real people behind the scheme? Second, because you most probably deal with an unregulated overseas organisation/business, where do you turn for help? When I got scammed, I also tried to get my money back but it turned out fruitless. The whole process is so time consuming and frustrating… Finally I gave up and had to accept I never see my money again. There was a good thing in that otherwise ugly event, though. The good thing was that I became determined to figure out how to make passive income online in a legit way. And that’s how I found this. If you have not seen/tried it before, take a closer look. It is 100% worth it. Especially because it is free to get started and you won’t risk a single penny. So here’s what I recommend. If your loss is not big, better call it “lesson learnt” and move ahead. You waste your time trying to get your money back (and it will cost you more than you lose them). However, if they scammed you big, research online – there are businesses who help you get your money back. You obviously have to pay them. But make sure they are not scams. Dig deeper and see what their background is. Are they legit businesses and do they really deliver or they are only all talk. Thank you for the enlightening review about Michael Crawford of Quantum Code. Unfortunately, it was too late for me. I am quite confused though. When I registered (and of course made a $250 investment thru my credit card), I got an email from Jones Mutual. Could this be legit? If I, indeed, got scammed, is there a way that I can still recover my money? Any advice would really help. Thank you. Hey, Jon Felipe, and thank you for the feedback. I am sad to hear you’ve lost your $250. No, even when they send you an email, it does not mean that they offer you a legit or real opportunity. Remember, the only thing they want from you, is your money. They want to keep contacting with you in order to squeeze more out of you. Be very careful! As for getting your money back, well I have my doubts. The problem is that they are professional scammers and know how to hide they footprints. You don’t know a single (real) person behind the scheme, do you? It’s very difficult. What I think is that if you turn to one of those companies you will pay out even more money. It’s just not worth it. Truth be told, I have lost money to scammers as well. I tried to get it back but, as I said, they just disappeared and I was left empty handed. So what I did was – I decided to turn my mistake into a valuable life lesson. OK, I paid this time but I decided to be much, much more careful next time. And second, I was determined not to give up but find a way to learn how to make legit money online. And that’s when (and how) I found this all-in-one training platform for those who want to work from home and create their own passive income stream online. If you’re interested, have a look here right now. I got this email this morning from this so called Michael Crawford guy but after watching his video, so many red flags went off in my mind. Everything in the video looked fake – the people, the places he had gone to, the house with the swimming pool and basketball court, etc. My phone system gave a no secure red flag alert. So I decided to research to see if this was a scam or not and I landed on your page. Thank you for sharing the truth about this charlatan, and con artist, and actor who are preying on innocent people in hopes that they fall for his lies and hypocrisy. Hey, Emily, and thank you for comment, testimonial, and for your kind words as well. I am very happy to hear that you found the Michael Crawford Quantum Code scam review helpful. Your inner feeling was absolutely correct – as you could see yourself (and as I proved it in the review), everything about Michael Crawford and Quantum Code was fake, false, and fabricated. And of course the guy that called you was NOT Michael Crawford. Most probably it was one of those high pressure sales people who work in those boiler rooms (read more here on how boiler rooms work). To sum it up, Quantum Code scam is a clear rip off scheme that preys innocent and unaware people. Terrible. I am so glad you did not join their dirty scheme and they did not get your money. Thank God for that. Hi there .. I nearly clicked the button to Join Michael Crawford .. sounded just what I wanted. I decided to check him out on the internet first and found it is all a scam .. hard to believe it looked so real. I have no money, it’s sad and horrible there are people out there that take from people who have nothing .. not a bean like me.. living from hand to mouth trying to make ends meet. I found your articles on the web about this man .. extremely helpful. This Michael Crawford man lied straight away stating it wouldn’t cost me anything .. but of course it does .. you have to pay $250 to set up a binary account .. obviously he’s not going to give you the $250 dollars to start set up your account..
..if Michael Crawford was offering this .. then it would all be free .. so yes “”ALL READERS BEWARE”” .. always check things out on the internet FIRST, as its all on there. Thank you very much for your article. Hey, Hazel, and thank you for dropping a comment. Glad to hear you found the Quantum Code review helpful. Not only helpful. Glad you did not get ripped off. Yes, they look so real… These con-artists know human psychology extremely well. They know how to strike the cord and make you act at once (i.e. surrender your money/credit card details). And that’s why so many unaware people get scammed world wide. Tragic. 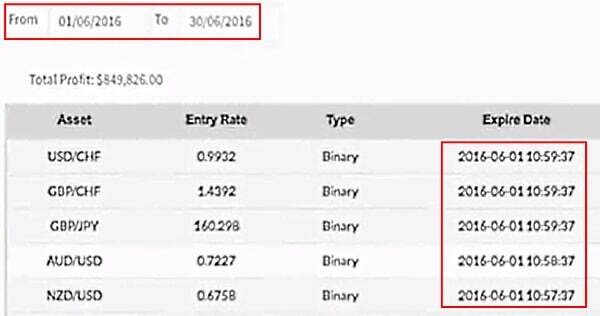 As for trading Binary Options… Well, it’s extremely high risk business opportunity even if the platform and broker are legit ones. Binary Options are clearly not suitable for novice traders. If you want learn how to make some side money (or full time income) online, there are much better options available. And best place to start is always one that doesn’t cost you a cent, too. If you are interested, just click here right now to see if it can help you. Thank you for the comment, Michael. I am glad to hear you found the review helpful. Also, I am glad you did not fall into that shameless trap. Best review on this binary investment crap. I honestly looked into it for myself, because I wondered if it were real. I didn’t know the guy was an actor though. I wonder who are the shady people behind this. Either way, they never got my money. And it’s unfortunate that other people fall for this stuff. Keep doing the good job of steering people away from these traps. Hey, Ade ,and thank you for the feedback. I appreciate it a lot. Also, thank you for the kind words. It’s encouraging. I am glad to hear you have not fallen into this trap. As for these scammers, I have no idea. However, I have seen that many different scams originate from the same source. Sometimes it’s like a spider’s nest. It so huge. And when one scam is shut down or does not bring money in anymore, they rebrand it, record a new video using other actors and exploit it again. Disgusting. And yes, it is heart breaking to read and hear how innocent (often desperate) people keep falling into these ugly traps. That’s why I write these reviews – to raise awareness about scams and protect people from getting hooked. … but if you don’t check you never know whether it is genuine or it is just a sugar coated masquerade. Great that you did not fall into that trap. PS. If you’re thinking of learning on how to make legit side money online, have you already this? Yes, I am using it and it’s free to get started (no credit card required). Want to find out more? Just click here. This seems like a complete sham, you can`t guarantee anything when it comes to things like this. Great job on this article, anyone who reads this will be foolish not to steer clear of this program! Thank you for the comment, Vlad. Of course they cannot guarantee anything. All that smooth talk is only to deceive innocent and unaware visitors into believing they can make Big Bucks quickly and without any risk at all. 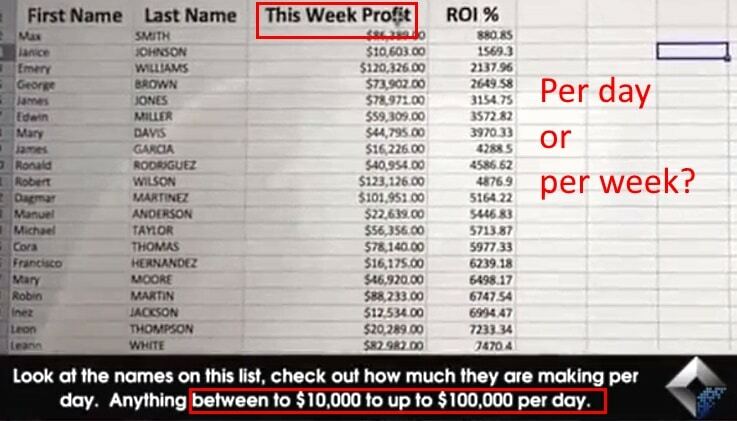 Yes, making legit money online is possible but it’s far from being get quick rich, as many people think. Building a passive income stream from scratch takes both time and hard work but it’s absolutely worth it. Once it start delivering, it will reward you for years. And, in my humble opinion, this is the best place to get started. After all, it won’t cost a penny to see whether it can help or not. OMG. That’s a lot of red flags there! So these people ask for $250 to everyone and then they trade with that money and they’re actually who are going to make the big bucks, right? Man, I wish all this Internet scammers suddenly grew some conscience and realized the amount of lives they’re screwing up. Thank you very much for the comment. In fact, there are many more red flags… My post would be 3000-4000 words if listed and analyzed all of them. Anyway, even these contradictions prove the case easily – the Quantum Code is nothing but a wicked fraud – designed to make its customers part with their money. The truth is, there is awesome training available on how to create a passive income online and it won’t cost you thousands of dollars to begin with. Even better, some of these are completely free to get started (try this one for size, for example). Thank you again for the comment, Israel. I was just sent a text message saying that I was one of the 20 selected for this huge opportunity, of course as a retired Military Police Officer I did my research, and you better believe I’m glad I did. IF IT’S TO GOOD TO BE TRUE, IT 99.9% IS! SO PLEASE, DO YOUR INVESTIGATION, DON’T WORRY ABOUT THE FAKE COUNTDOWN CLOCK THEY HAVE, BECAUSE ALL YOU HAVE TO DO IS REVISIT THE SITE AND IT WILL RESET. STAY CLEAR OF MICHAEL CRAWFORD (ACTOR). AND THANKS FOR THIS RED ALERT SUMMARY. Thank you very much for the comment, Lee. I am glad to hear you did not fall into that nasty trap. Also, BIG thanks for the warning you gave to my readers. Scams like these almost always use these “20 only” privileged group bite, fake countdown clock, etc. All that to make an impression as if you have accidentally stumbled across a once-in-a-lifetime get rich opportunity. But you must act at once. Unfortunately, people tend to act without checking. I don’t know why. Probably they are afraid to lose that opportunity. That’s tragic.